CWDM DWDM transceiver modules are used as a part of CWDM or DWDM networks to provide high capacity bandwidth across an optical network. 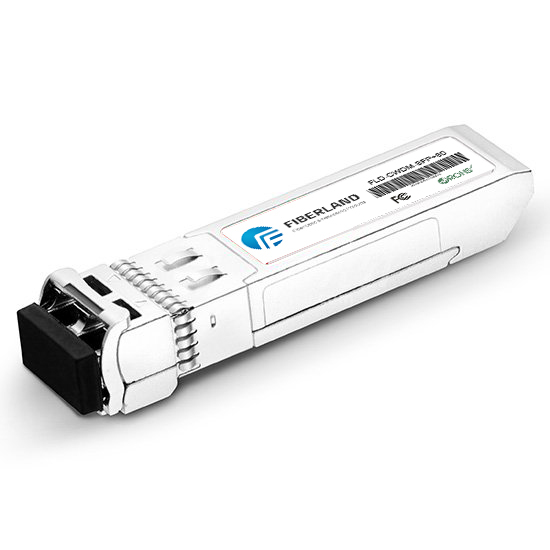 Fiberland CWDM transceivers can operate on 9/125 single-mode fiber to 40km or 80km by using special CWDM channels (1270nm to 1610nm, in steps of 20nm). While DWDM transceiver can support a link length of up to 40km or 80km on single-mode fiber by using special DWDM channels. CWDM DWDM transceivers are worked with a variety of network equipment such as switches, routers, and optical transport devices, to link the ports to the fiber optic network. CWDM DWDM transceiver must comply with SONET/SDH, Gigabit, Fiber Channel and other communication standards. They are available with a variety of different transmitters and receiver types, allowing users to select the appropriate transceiver for each link to provide the required optical reach over the available optical fiber link. Dense Wavelength Division Multiplexing (DWDM) solution includes DWDM XENPAKs which allow integrating WDM transport directly with Cisco 10 Gigabit Ethernet switches and routers. The DWDM XENPAK and DWDM optical filter and amplifier products enable the design of a flexible and highly available multi-service network. The DWDM XENPAKs can be used for un-amplified and amplified designs to transmit up to 320 Gigabit over the same pair of SMF. DWDM GBICs allow to integrating WDM transport directly with Cisco Gigabit Ethernet switches and routers. Similar to DWDM X XENPAK, the DWDM GBICs interoperable with the same ONS equipment, they can be used for un-amplified and amplified designs to transmit up to 32 Gigabit over the same pair of SMF. Coarse Wave Division Multiplexing (CWDM) solution allows scalable and easy-to-deploy Gigabit Ethernet (GbE) and Fibre Channel service. The combination of CWDM GBICs and SFPs and CWDM Optical Add/Drop multiplexer modules enables the design of a flexible and highly available multiservice network. CWDM GBIC/SFP solution has two main components: a set of eight different pluggable transceivers and a set of different CWDM Mux Demux or OADM. Fiberland CWDM solution offers a convenient and cost effective solution for the adoption of optical Gigabit Ethernet campus, data center, and metropolitan-area access networks. Our CWDM solutions consist of a set of eight different SFPs, a set of 8 single wavelength/dual channels OADMs, two 4 channels OADM/Mux and an 8 channel CWDM along with a CWDM rack mountable chassis. CWDM SFP+ module allows enterprises and service providers to offer scalable and easy-to-deploy 10 Gigabit LAN, WAN, and optical transport network service in the network. CWDM 10Gig SFP+ transceivers are 18 center wavelengths available from 1270nm to 1610nm, with each step 20nm.